Who is Stevie Ray Meeks? Since a child I have always had a passion for treasure hunting. Living in Sanford, Florida for 50+ years, which is a town rich in history, has given me an opportunity to fulfill my passion by metal detecting. I am a member of The Central Florida Metal Detecting Club and have won numerous awards. Since I have been a member of this club I have been involved with several "search and recovery" requests from local police departments for weapons and other crime related items that can only be found with metal detectors. I try to bring my personal passions into my professional passions and have the perfect merging of the two. I have a hobby which is my job, therefore I have the perfect “hobby job.” Hopefully I can bring the thrill of the hunt and the passion I feel for metal detecting to my customers by giving them the right knowledge and equipment they need to enjoy this great hobby. My favorite go to machines are the Garrett AT Pro and AT Gold, which I have been using for six years. I also have a Fisher, a White's and a Minelab for different types of hunting. "Thanks for all the wonderful help you have given me, you surely have earned my business and if I can refer anyone I most certainly will, I was in yesterday and picked up a scoop for the beach and I am glad I did, I also love my Garrett Ace 400 you sold me, it works fantastic at the beach! I found a few cool things in the wet sand yesterday at the beach and also a cache of coins near breakers, I promise I didn't clean it all out... Thanks again for the outstanding customer service and tips you have given me! Surely I will be back for more metal detecting stuff when I am ready! Thank you sir very much!" "P.S. I am attaching a picture of my finds yesterday!!! 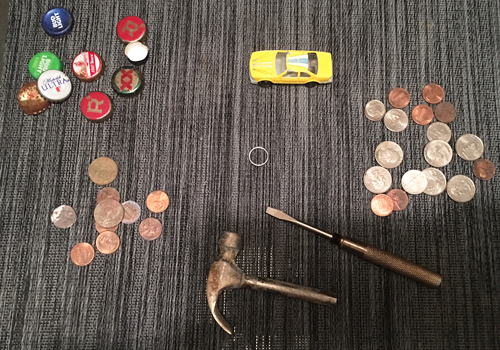 I found a new car, a hammer , a toe ring, and in one spot I found almost two dollars in coins!!! Wooohoo!!!"